The dermaroller is becoming an increasingly popular technique used to restore collegen and to create a more youthful complexion, along with other amazing benefits. What Actually is a Dermaroller? A dermaroller is a small hand-held device used for both body and skin rejuvenation, which is also known as Micro-Needling and Collagen Induction Therapy (CIT). 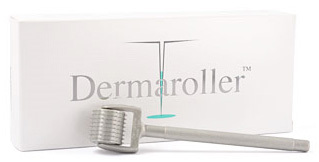 The Dermaroller contains 540 titanium coated micro surgical needles that are rolled across the skin, which creates tiny punctures, to penetrate the deeper surface of the skin and stimulate blood flow; forcing the skin to repair. The repair response causes skin to thinken and produce new collagen, revealing plump, new skin and giving you a clearer complexion! How Can You Benefit From This Treatment? Proven to restore the firmness of skin, dermaroller treatments on the face also help improve the appearence of aged or sun damaged skin and acne scars, result in a clearer complexion reducing pores, and fades lines and wrinkles. This treatment is also suitable for areas of the body to help reduce cellulite, remove stretchmarks, stimulate hair growth and minimise other types of scarring. Dermaroller therapy allows the skin to repair itself naturally and safely. As well as the physical benefits and improvements that it can have on your body and skin, it can also give you a new found confidence and help boost your self-esteem. Dermarolling can be painful, as the procedure involves the repeated pricking of your skin, however here at our clinic, the treatment is carried out by our skin care specialists ensure you will receive the best possible professional, high standard and quality care. Interested in dermaroller therapy? Call us on 01708 225555 or contact us.